I read Shadow after Ink and I think that greatly influenced my view of the prequel. Personally, I find it hard to review a prequel when I've read the first book in the series before it. I feel like I already know a lot or even just enough about the characters and the story that the prequel won't appear inadequate. Or that the prequel would somehow give me a little more of the background that I didn't get from the first book and that alone would satisfy me. Such was the case with Shadow. Tomohiro shared the spotlight in this book. His chapters revolved around his relationship with Myu and his nightmares. I particularly liked his chapters more because I felt like I was meeting Tomohiro for the first time. He was such a mystery in Ink that I was so eager to read every chapter that centered on him! Through Tomohiro's vividly described nightmares, readers are given a glimpse of the hell he, and every other kami, has to go through. Aside from that I was also able to appreciate Tomohiro's humanity; he explains why he decided to date Myu and that he actually likes her. When I read Ink I didn't quite understand Tomohiro and his decisions but in Shadow, I somehow got the explanation I was looking for. As for Katie's chapters... well, I can't say I like her better now but at least she's tolerable. She's grieving the loss of her mom, her childish reactions were understandable, I think. What I really liked about Shadow, however, was the little connection made between Katie and Tomohiro - and I won't be spoiling it for anybody. Katie's role in all of the inky weirdness was still cryptic but reading that part gave me chills (sorta). The writing wasn't an issue for me in Ink and it still wasn't an issue with this one. 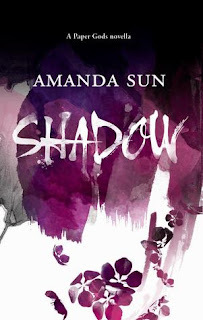 By the time I read this I was already used to Amanda Sun's writing. I wasn't bothered by the frequent use of Japanese words or slight info dump about Japan. I might've rated it lower had I read this before Ink but I got what I was looking for so... bottomline: writing was, meh, okay and the back story was sufficient.